It has far surpassed the number of people who ‘liked’ a photo posted by Kylie Jenner so much they committed to a double-tap in their droves – 18.2 million Instagram users to be precise – in order to give their seal of approval. The 21-year-old beauty boss’ photograph was simple; a picture of her baby girl holding onto the Kardashian Klan member’s finger, shared to announce the name of her newborn. And so in February last year 18.2 million people were quick to help welcome Stormi Webster into the world of nepotism, fame and fortune. 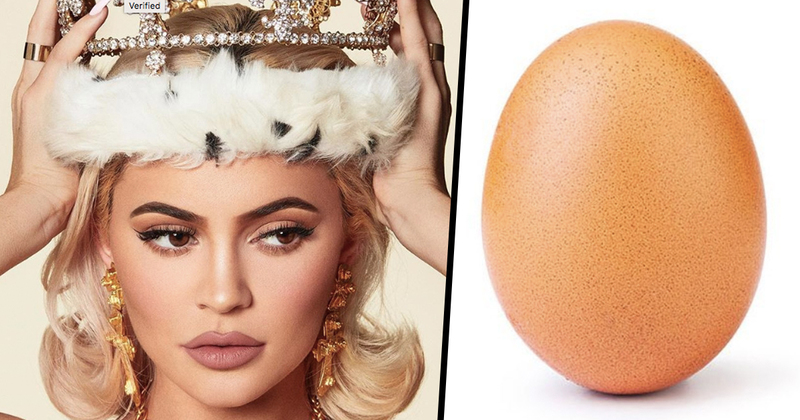 Jenner fans aside, the World Record Egg (the WRE, to its fans) is the least divisive thing the internet has seen since MySpace Tom’s profile picture. It is neither poached, nor scrambled. It is not here to start debate over the perfect preparation and presentation of an egg in culinary terms. It simply is, as it always was from birth, and always will be; an egg-istential mind tickler. A Very Good Egg, if you like. But what does it mean? Does the egg point to our fetishisation of objects? Is it a comment on consumerist society? It it a parody of the finely curated and air-brushed aesthetic Kylie Jenner herself has popularised, which now plagues the formerly organic photo-sharing platform, bastardised as it has become by so-called influencers looking to make an easy buck of narrowly-defined beauty ideals? Is it an exemplar of what we can do when we all put our hive mind to a task? We have collectively usurped Jenner, and a whole new Jenner-ation in little Stormi Webster, from the Instagram throne. What next? Over-throwing media dictators by choosing more wholesome and worthy content to fulfil us rather than bottom-feed of vapid trash? As with Charlie Brooker’s Black Mirror interactive episode, Bandersnatch, we have championed The People’s Egg and changed the course of what really matters on social media, an online realm where most of us exist for more hours a day than we spend asleep. You might not think this is important but is actually feeds into something called The Economy of Attention. It’s a marketing term pinched and applied to the modes and means of divvying out pixellated popularity on social media by Bailey Parnell, an expert in Marketing, Communications and Culture at Ryerson University, who told UNILAD anything which takes up this much of our time requires some critical thinking. It all started with MSN Messenger on dial-up Internet, when the world seemed to open up from the comfort of your living room. Then there was Bebo, where you used to ‘share da luv’ with three of your Top 10 Friends, in a daily ritual exchange reserved for the ‘best’ people. Later the social media site du jour became Myspace, where the notion of Pc4Pc (picture comment for picture comment, d’uh) encouraged everyone to start trading social media reactions like commodities, caring less about who liked your pictures than the sum total of love hearts or thumbs up. Call it a dumb egg; an exercise in time-wasting idiocy, if you must. But, like it or lump it, these trajectory of increasing online existence have blindly led us into a world where the number of double taps on a stock image of a shell of an egg is newsworthy and – moreover – actually exciting. On the other hand, the slightly more fatalist reading would offer a different reason for the World Record Egg’s success. It seems, at a time when everyone and everything else is dogshit, we have grown accustomed to developing deep emotional attachment with inanimate objects to protect our weak, millennial hearts from being burned like the bottom of an omelette. And I, for one, omlettin’ it slide.